Glazes that I have used with students at WSI, Nepean. You are welcome to download the PDF of a Glazemaster file that gives a material recipe as well as unity formula. 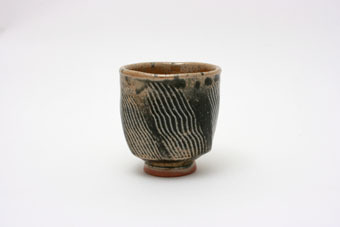 Scroll down for glazes for cone 9, cone 5, earthenware and raku. Glazes for Stoneware Reduction Firing, cone 9-10. Sushi Plate by Jo Woods, Ro's BH white glaze and Blue Spangle. Rob's BH White is a glossy, opaque white. Easy to apply, more forgiving of the odd uneven drip, no crawling, hard wearing in a dishwasher, craze free on Nepean Tafe clays. 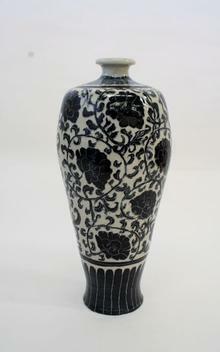 A smooth and non powdery unfired surface making it a good base for overglaze in a high temperature majolica style work. On it's own is very stark, so few dots of Blue Spangle of this cast sushi plate work well. 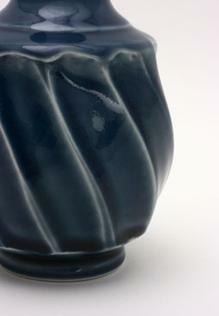 Blue Spangle is dark blue glaze that develops yellow crystals, especially with a slow cool in a brick kiln. Usually used a highlight, rather tha n all over glaze. Gets its orange colour from a reaction between the sodium and alumina in at high temperature in reduction. 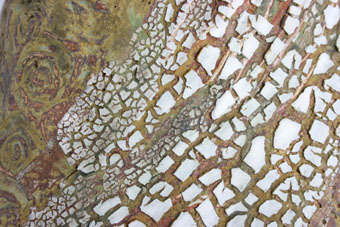 Soda ash and early kiln reduction (say 850oC) can trap black carbon in the melted glaze in a beautiful way quite often. 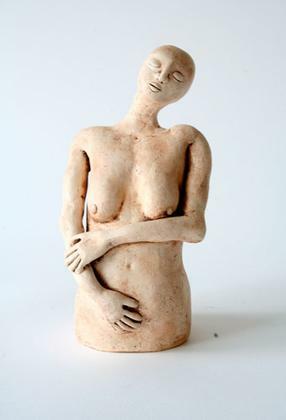 Soda ash is water soluble and will crystallize on the surface of the drying glaze. These crystals will often show on the fired surface, so be very careful handling the glaze before firing or your fingerprints may show on the fired piece. Best to make a small quantity and use fresh. At Nepean, we take 2.5 kg of Ceram B and put in a bisque firing in an old bisque fired bowl. Add all of this (don't spill any. It will weigh a little less after the calcine firing, so weigh accurately before the calcine firing) plus 1kg of unfired clay to make up the 3.5kg. You need to use hot water to get the soda ash to dissolve. 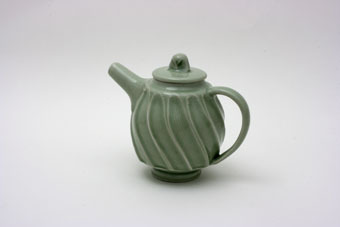 Beautiful glaze, difficult to mix and very variable. 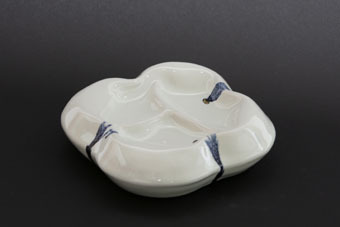 A dark semi gloss blue on white stoneware or porcelain. Uncrazed on high silica clays like Walker 10, Walkers Superior, Keanes Porcelain. Shows texture very well with a medium to thick application. Use a little thinner as a base for overglaze. Developed by Nathaniel Mikhael in Rob's Glaze Technology class using Glazemaster software to convert a published base recipe to Australian materials. This one has iron and cobalt carbonate as colourants. We now use Cobalt Silicate from Western Australia. Much cheaper, you can get it from Vic at Potter's Needs. 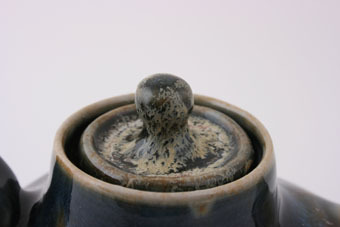 Teapot by Rosemary Tucker, with yellow overglaze over Nepean Tenmoku.Nepean Tenmoku is a fairly glossy black with an iron brown break over edges and texture. Original unity formula from http://digitalfire.com/index.html adjusted for Australian materials. A good non crazing clear in oxidation or reduction at cone 9-10, that is very forgiving and suspends well. 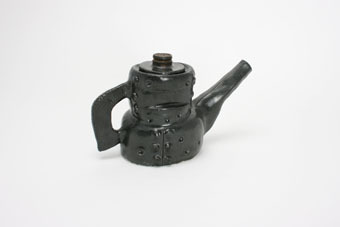 "Ned Kelly Teapot", by Lyndon Matts. Black Matt Glaze, cone 9-10 gas reduction firing. 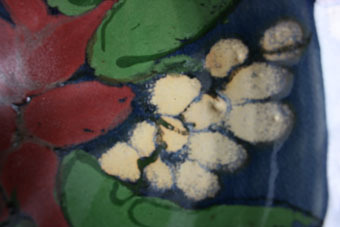 Yellow Accent glaze, used here over Nathanial's Blue, with Chrome Green and Red. The same recipe as the clear without the zinc, making a more translucent glaze with very fine suspended bubbles and a small addition of iron for green in reduction. Best used very thickly on porcelain at cone 9-10. 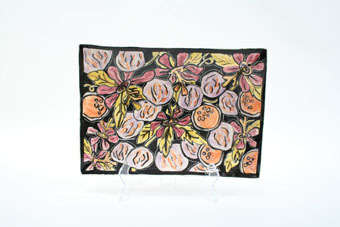 Image of Sue Evans decorated platter, with various underglazes and cone 5 clear glaze. Semi matt clear, that suspends well, easy to apply and fairly cheap too mix. High calcium content means it is more matt with slow cooling in a large brick kiln. 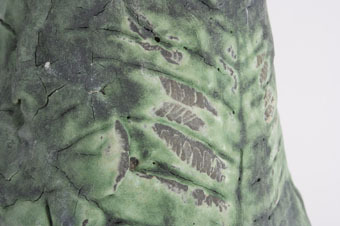 Dramatic glaze often applied unevenly over textured sculpture. Brush on, one coat is green, 2 coats blue, 3 coats runny glossier blue. Brush on one coat, working into any texture. more gold when thiner, blacker where thicker. If used more thickly gives a gunmetal finish, like welding slag. Toxic in the raw state, not food safe. 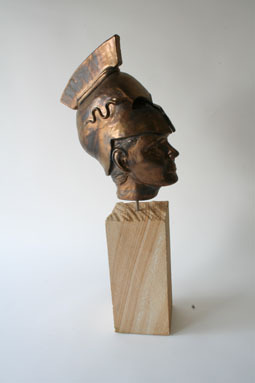 Sculpture by Michelle Johnson. Mid fire engobe with 3% iron oxide and 3% copper carbonate, brushed over textured surface. Apply over raw clay and fire to 1180oC. 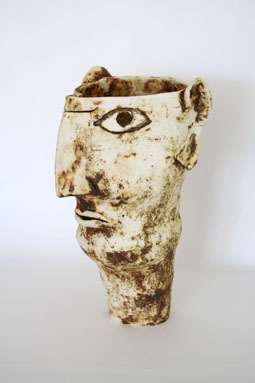 You can also apply over raw clay, bisque fire and then apply dry glazes over. Very beautiful smooth surface, like marble. Takes colorants well. Use thickly. Non toxic. 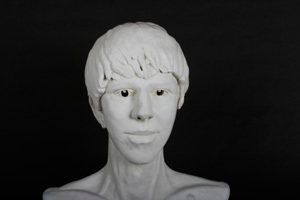 "Self Portrait" by Nathanial Mikhael. 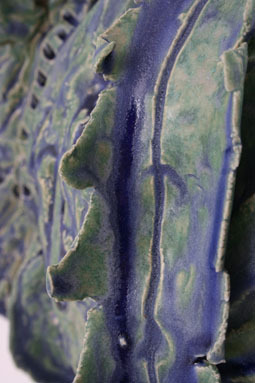 Mid Fire crawl uses magnum carbonate to deliberately make the glaze crawl and introduce texture. Brush on, thin application for smaller crawl, thick for wider.Shown her over mid fire copper/iron engobe. 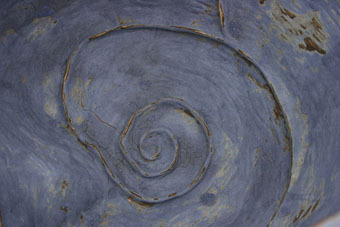 A simple wash of iron oxide and water. 3 heaped tablespoons to a 500 ml jar of water. 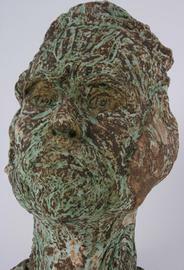 Brushed on with a firm brush on bisque fired white clay, and then sponged off, leaving copper in the textures. Use a flat piece of firm sponge and rub in one direction only. Keep rinsing the sponge. Allow the rinse water to settle and you can reuse the iron. A single wash of copper carbonate and water. 3 heaped tablespoons to a 500 ml jar of water. 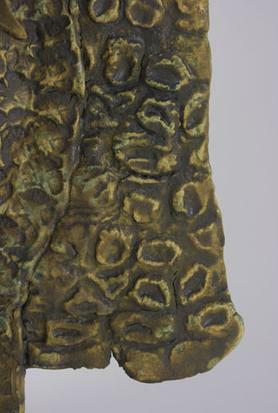 Brushed on with a firm brush on bisque fired white clay, and then sponged off, leaving copper in the textures. Use a flat piece of firm sponge and rub in one direction only. Keep rinsing the sponge. Allow the rinse water to settle and you can reuse the copper.